September was a bit quieter than August, but not by much. Diane and I continued to be involved in the music scene, at Chestnut Creek School of the Arts, and my camera was pretty busy also. I volunteered at CCSA one day a week and sometimes two. Diane had two basket classes to teach and I planned to help her, plus I would be teaching photography classes in October.. I had hoped to do a seven week, ninety minute one night a week class. It was to be a series based on my photo lessons I have here on my website. That was supposed to happen in September but didn’t work out so we decided to have two Saturday morning classes in October. Everyone should know by now that kite flying is one of my passions. I love because it isn’t an expensive hobby and its a lot of fun. It is also a thing that lends itself to living in a motorhome. All my kites fit into one big laundry bag. I can throw the whole thing over one shoulder, or stow it in the back of the car. Most importantly, it fits into a small coach storage compartment. On Sunday of Labor Day Weekend, I packed my camera, my bag of kites and took off in the car for Banner Elk North Carolina. I wanted to attend the 16th Mile High Kite Festival’s second and last day. I guess I should have gone on Saturday, because Sunday was a complete bust as far as kite flying was concerned. Thunder and lightning puts a stop to that right away and that is what we had. I had a beautiful ninety minute drive down the Parkway, stayed for less than an hour, turned around and drove home in a huge nasty downpour. Sometimes things just don’t work out. Last year Diane and I went and there was sunshine but not much wind, this time we didn’t have either one. Well, there is always next year. The DCMR Labor Day Golf Tourney and Food Fest was a success, like always. The weather was good, the golf course was in great shape, and I was on the winning team. Can you believe it? Team captain Stan, really had more to do with that win than me. I made a few good tee shots and a couple of good putts, so I helped us win a bit. The golf was fun, the food was good and the entertainment was good too. Diane and Ed gave a good performance, providing music, and history of the dulcimer and of the old time songs. Stan and Patty’s son Kyle, a good guitarist and singer, followed Diane and sang many well known songs, ones that us old folks love. So there was some singing along at times. We walk Teddy Bear most mornings very early. I decided to carry my camera one morning. We had company at the fence which borders DCMR and the farm on the hill and they were willing subjects for my lens. The sunflowers were a bonus. For the next few weeks, life was quieter, the weather was pretty good as well. We spent a lot of our time sitting on our patio, umbrellas up. We read, played dulcimer, well Diane did anyway, and she finished her dog food storage basket. I continued to volunteer at Chestnut Creek School of the Arts. CCSA is located in an old bank building and the bars that protected the safe deposit box area were discovered in an old warehouse. Diane and I came up with a way to “recycle” them. The idea and its implementation was a big success. See for yourself! There are hand made beautiful scarves displayed on the bars now. 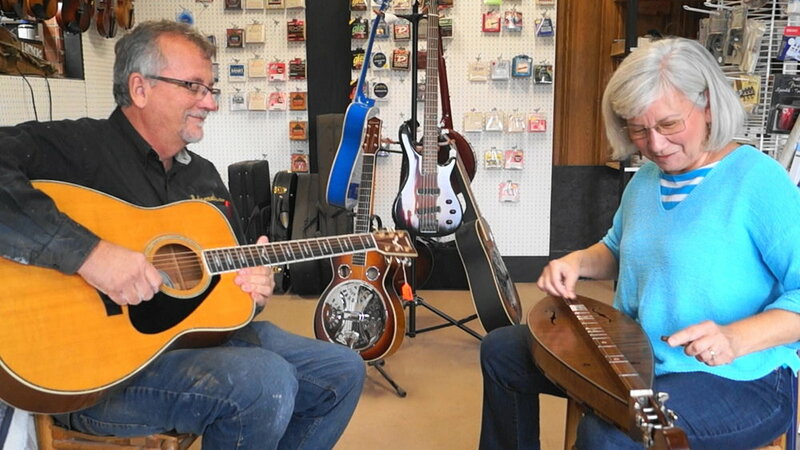 Diane and Jimmy Edmonds were still working together to build her dulcimer. They talked about the shape, the tuning pegs, the type of wood, the sound holes, fret board design, all kinds of things. This would be a very special dulcimer, the first of its kind, a new design using modern guitar building techniques, although it was inspired by area history. This history was on display at the BRMC museum. Sept 21 was a special day. Diane and I dropped in on Jimmy’s shop just to see the progress he was making. There had been a lot of it. Diane’s heart jumped when she saw her new baby for the first time, put together. She had seen the pieces but seeing it come together was really something. Diane’s new musical baby was still weeks away from being finished, it needed to be stained and receive multiple coats of a special varnish with lots of sanding between coats. The weather, which had been very wet for awhile, needed to cooperate for this to happen. The excitement was building but the wait was not over yet. That was okay, we still lots of things happening that would make the time pass quickly. We went to a Friday night show at the Rex, The New Ballards Branch Bogtrotters were playing an evening of Old Time Dance Music. We didn’t dance but we were always good listeners. We were invited to a pot luck lunch of side dishes, hamburgers and hot dogs, at the BRMC. It was an appreciation lunch for those of us who volunteered that year. Some of us were car parkers, gift shop operators and other things. It was nice to sit down and talk with our fellow workers. Diane started finalizing her basket weaving classes and I continued to work at CCSA. At the end of September something special took place. Sam, visited us while on a cross country RV trip. Sam lives in Burbank California. Sam retired from the TV industry. He worked for the Disney Channel on shows like Hannah Montana, and others. He also worked for years on the Married with Children series among other things. Sam used to be my boss, and Diane’s too. This was back in Charlotte during the 70s when we all worked to make the PTL Club television program and network function. I was a cameraman and the main lighting guy, Diane was an assistant director. Sam directed the PTL Club and was the PTL Network production manager. Not long after Diane and I left there Sam became the Vice President of Operations for the whole place. We had a great time telling old “war stories“ about our time at PTL. Maybe I will tell a few of them here some day. We also took the time to catch up. Considering we had not seen each other in over forty years, there was a lot of that to do. We took Sam to the Twisted Fork, how could we not? I had Shrimp and Grits of course. We drove to Fancy Gap to our favorite deli, for soup and meatloaf sandwiches. We went to Fries for the Thursday night Jam, and visited the music center. It was a very short time together but Sam had put himself on a pretty tight schedule with lots of places to go and old friends to visit. Sam’s daughter called Sam’s trip “The Adventure before Dementia.,” She owns a screen printing business so she made him a T-Shirt with that phrase printed on it over a Class C motorhome, which of course looked exactly like Sam’s. Teach five nice ladies how to make a large multi-colored Appalachian Egg basket. The class would take place on a Saturday, at Chestnut Creek School of the Arts. Patty C and her finished basket! Diane and her class assistant (that happens to be me) found out that a nine hour one day basket class is a lot of work! It is a lot of work and a bit tiring even with an hour off for lunch. It was also fun, and the best thing about it, the ladies all loved it. They loved it so much that Diane set the date for a second class which would take place over two mornings. This time she would instruct on making a multi-colored wine basket. October, is it ready yet? Once again we checked on Jimmy’s creation for Diane. We needed to measure it for a new padded case. This beautiful instrument needed to be looked after really well for sure. Was it finished yet? Not quite, the much anticipated wait would last a bit longer. Diane with a very big smile on her face, told Jimmy she was getting very antsy to play this wonderful dulcimer. This event not only tasted great it was great fun! We had to postpone it from days earlier due to bad weather, the golf course needed to dry out as much as possible. I had heard about playing golf with glowing golf balls, lights attached to the pins and ourselves so we could see something. It started out with great appetizers brought by us all, and tacos provided by our hosts, and then the main event which was a laugh riot. I found out I play no worse in the dark than I do in the light of day. You can tell it was a blast. I am sure we will have this event again next season. 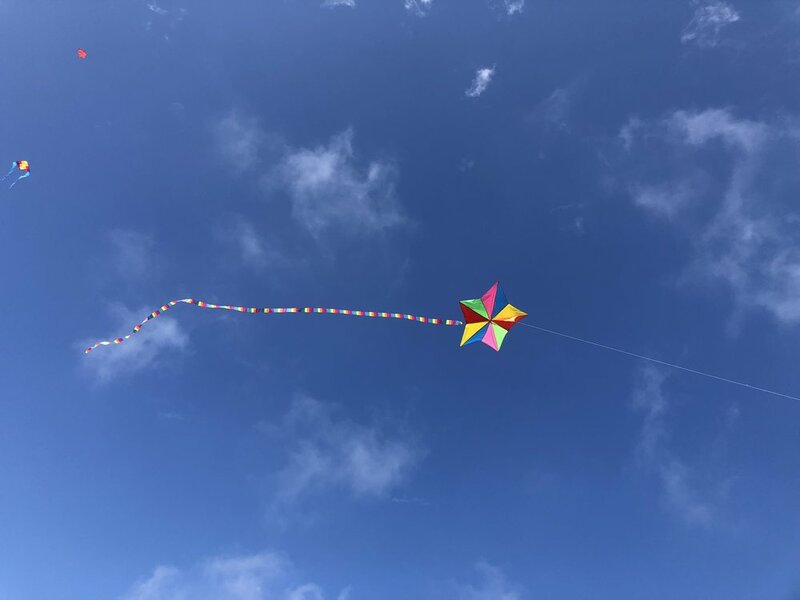 Saturday, October sixth was Kite Day! Our first annual I hope. We had wind, but it was not that good. it swirled , it dipped up and down, and at times, I could swear it was blowing in two directions at once. I got a very good price on some small very nice rip-stop nylon kites. They are called Little Diamond kites. I ordered twelve of them for DCMR folks. They came in a box of ten plust two extras from Emmakites in China. Most of the folks who bought kites, came out to fly them when they saw one of mine up, the flow tail delta. 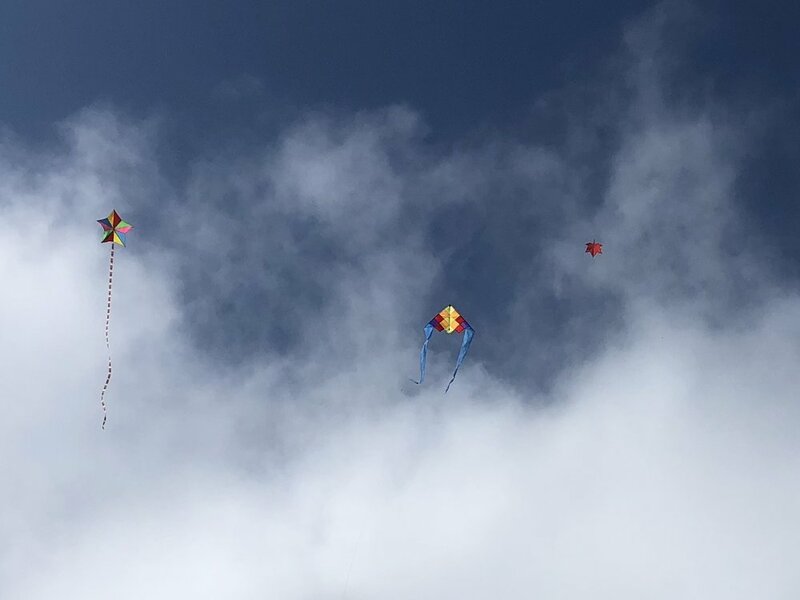 A couple people launced their kites right away including Bob whose kite is seen flying with mine in the pictures that Nicole, our neighbor took with her I Phone. I helped people try, sometimes successfully, to get their diamond in the air. I handed off my maple leaf and the delta to Chris and hubby Tom to fly them as long as they wanted to. They had a great time. The best thing was that it made people feel like kids again, which is one of the reasons I fly kites, it may be the biggest reason. On the New River Again, which never gets old. A better selfie, clean smiling face! Sunny Sunday October the seventh was our wedding anniversary, our forty-sixth to be exact. What is that steel? Or Sapphire? Nope, its poetry. I just found that out. I guess Diane will be getting a poem from me very late. However, I would like to suggest that the perfect gift for one’s 46th is a special wood, curly maple. It sure made a good gift for ours. The gift of friendship is also good. We received that on our anniversary. The celebrating that Diane wanted do involved packing a lunch for two and taking a river trip. When our very good friends Bob and Sandra heard that they offered to shuttle us. They drove us to the take out spot where we left our car, put our kayak in the back of their car and then they drove us to the launch site and said goodbye. Diane and I spent a perfect three hours on the New River again, beautiful day it was too. The next day, Vanessa and Mike our hopefully new neighbors next season, had to leave so Vanessa came over to show Diane her lovely completed basket. They talked for awhile, and not long after that a rainbow showed up out of nowhere. I had to take a picture of it. We had nice weather for awhile and then it turned cloudy and cold for my Fall Foliage Photography class. We meet up at the Blue Ridge Music Center, and noticed that there was no fall color, not yet anyway. I think I still managed to teach my four students a few things. I talked about the Rule of Thirds, Framing, the proper way to hold a camera and took the class into the meadow behind the center to have everyone look, imagine a shot, and then take it. I did the same thing that morning before my class got there. I am a firm believer you can’t teach what you don’t know or practice yourself. I figured with a little imagination and using my eyes, I could create some good pictures even on a cold and dreary day. The sun did come out and say hello. Our friend Martin, the owner of the Brier Patch Cafe, and Antique Store celebrated his birthday party on a Monday, the same day as the Galax Dulcimer Club meeting. At the meeting the question asked Diane was “Is it ready yet?” No not yet. How much longer? “I don’t know but I can hardly wait!” was her response. Something about weaving a basket on a cold October morn seemed to make everyone involved pretty happy! The ladies threw themselves into it, reed was being pulled and measured. We ran out of clothespins, an essential tool, and I had to make a run, or should I say walk, to the Family Dollar store for some more. That is what the class assistant does. Donna and the multicolored reed. I found out that basket weaving is not that easy. It takes a lot of planning, skill and patience. Diane has the skill to do all three and she is good at teaching others. The day went well, although the baskets didn’t get quite finished. That was okay, because the class would pick up in the clubhouse and all would be finished there. On the way home we stopped at Jimmy’s shop again, the progress was very good, but we can’t take the baby home yet, its still in IC. I told you that September and October were busy. I didn’t remember how busy until I started putting this travel picture story together. What’s next? Our End Of The Year Party Is a bittersweet event. The clubhouse looked really elegant. The food, as always, was really good. We have a lot of great cooks at DCMR. The fellowship was also very good. Lots of great conversation with folks who would be leaving in a matter of days. DCMR would look very different in just a week. Diane and I attended the last concert of the year at the Blue Ridge Music Center indoor hall. The band was The Barefoot Movement, a Newgrass band from North Carolina. I can only say they were a wonderful group. We enjoyed them tremendously (I guess I can say more!) and we came home with a live concert on CD that they had for sale. It was a very good ending to a very good season at the BRMC. I look forward to next year with great anticipation. One morning during the last week of October I woke up before dawn, got dressed and took Teddy Bear out for his first walk of the day. I watched the sun come up over the clubhouse and then it started to light up the tree line on the pasture. It was one of the best displays of fall sunlight I have ever seen, I was really glad to have seen a bit of red from the coach window which caused me to grab my camera. I think it is one of the best pictures of DCMR that I have taken in nine years. Diane helped Beth, Donna, and Francis finish their wine baskets. Beth left for Florida the next day taking enough reed with her to make another basket as well. It seemed that Diane’s instruction had been a success and classes are planned already for next year. That is what it is. Jimmy’s first Galax style Dulcimer and a beautiful one it is. It came home with her on Oct 27th on a Saturday. We dropped by that morning, with her new case and Jimmy with a smile said it would be ready after 3pm. It just needed a bit of bridge work and some strings, which he and Diane picked out then. We went shopping for some things, made a run to the post office, had some lunch somewhere and as the time passed three we were at his door. We walked in, Jimmy looked at her and said, you want to give it a try? Of course she did! She sat down and played a few notes. It has a beautiful sound. Her face lite up. Then she it carried over to its case and attached a new strap to it. She sat down, Jimmy picked up a guitar and sat down with her. She looked at him and said “Wildwood Flower?” He nodded and they began to play. She missed the first couple of notes, I think she was so emotional and excited, We all laughed a bit and started again. I can’t say it enough, it is a beautiful mountain dulcimer, the prettiest and best sounding one I have ever seen or heard. Diane is in her words “Over the Moon” with it. She loves it and cannot thank Jimmy enough. It was a great ending to a great year here in Galax and Deer Creek Motor Coach Resort. I leave you with a couple more songs they played together. In case you are wondering, November and December will just have to wait until after the first of the year, after all they have not happened yet, not totally have they?